This product can also be used on stretch marks and open wounds to prevent infection and help with reduce scarring. 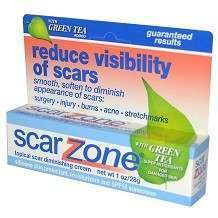 Scar Zone offers no information as to the ingredients except that it contains Green Tea. Why would the ingredients not be listed? Is there any particular ingredients that should be known? Are the ingredients safe? Are they proven to work as stated? Well, these are all valid questions that a consumer will want to know? Scar Zone has no recommended usage information available. How and when should the product be used? This can be very disconcerting to many consumers. Why would there be no information in this regard. This is something that one would consider very important information. This can really hurt a prospective consumer’s decision. There are no possible side effects listed. Are there any potential allergic reactions? Any side effects to long term use? This is all information that is very important to know. There are no long-term results that are listed, however it does state that most individuals should see dramatic results within 90 days of use. 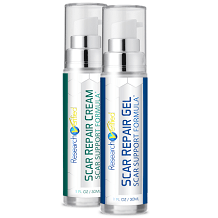 Scar Zone seems inexpensive when compared to other scar removal products. Does this low price state anything about the actual effectiveness of the product? Does this mean that the product is another product that claims what I want to hear? Scar Zone can be bought online or through a retailer. Scar Zone has a return policy that states to simply return the unused portion of the product, sales receipt, and UPC code from package and manufacturer will refund the full purchase product within 6-8 weeks. This guarantee only applies to products purchased in USA and its possessions. The return address is conveniently provided also. While Scar Zone is a good product, it is not as good as they say because of the complete lack of information on ingredients and usage. Scar Zone provides no information on the ingredients. This will give pause to even the most liberal consumer. Also, the lack of usage information means that there is no clear guidance for the use of the product. Can a consumer use it too much? Would my doctor know? Can this product harm me if it is overused? These are all questions that the consumer would be wise to consider before purchasing this or any product when so much important information is missing.